Very interesting. I note that the abstract claims that their purpose is to find a way of reducing the depth of the borehole, which seems a small cost saving to aim for. It seems to be based entirely on mathematical modelling, I cannot find a mention of a real building being used as a case study. There are some very useful and deeply mathematical methods of calculating the borehole size. That part of Canada has a 'continental' climate, and there's a very short summer, and a long long winter. 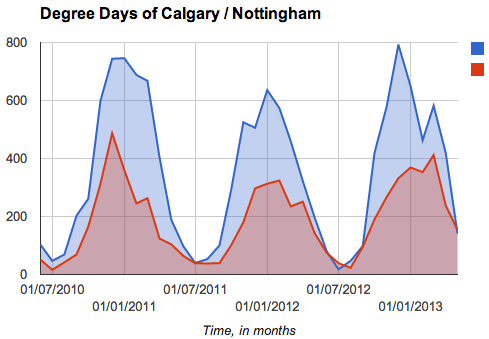 See the above Degree Day graph to compare Calgary [blue] with Nottingham [red]. This degree day curve symbolises the amount of heat required for comfort. It's so cold in Winter that you would keep the heating on overnight, whereas a well insulated house like ours in Nottingham, England needs no heating at night. Even in winter, it is off from 9pm to 8am. Solar heat is 'interesting' in a climate like that, but with such short summers and long winters, its a tough call for it to be significantly useful - but one of the most famous examples in the world is Drakes Landing, about 30km south of Calgary. It's useful to have that article with the formulae. It is also interesting that they propose to use an entirely separate but along-side set of pipes for the solar ground loop and GSHP ground loop. That is a good idea, if you are going to drill the hole:- make it big enough to drop two sets of pipes in, not one. This would avoid cross contamination, pressure variations, etc. 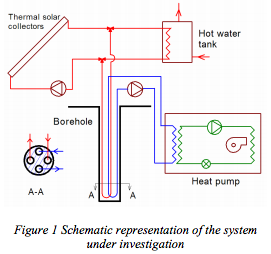 The GSHP loop can continue on cheerfully, even if the Solar loop is discontinued or faulty.